Preheat the oven to 190°C. Lightly grease (I used olive oil) an ovenproof dish. Heat the oil in a frying pan and add the garlic. Let it cook on low heat for 1 minute. Add the dried mixed herbs (if using). Cook for another 1 minute. Add the minced beef and cook for 5 minutes, breaking up lumps as it cooks, until well browned. Add in the tomatoes, stir and cook for 1 minute. Add the pasta sauce. Bring to the boil, reduce the heat slightly and simmer for 5 minutes. Season to taste with salt, pepper, sugar and dried parsley (if using). In the meantime, cook the macaroni in salted boiling water until al dente. Drain well. Spread half of the cooked macaroni evenly into the prepared dish. Top with half of the bolognese sauce, then the remaining macaroni, followed by the remaining sauce. Sprinkle the top with some extra dried parsley, if desired. 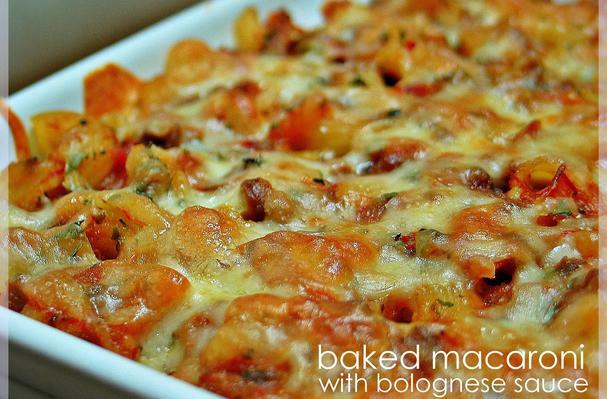 Top with shredded cheese and bake for 15~20 minutes, until the top turns brown and bubbly. Serve warm.